Hitting a festival this summer? If you are, and if this is your first time, our latest competition will definitely help. 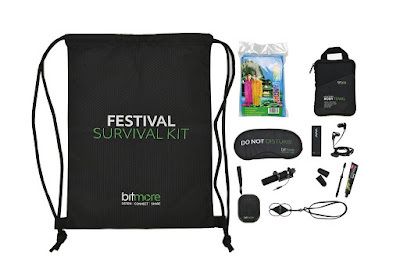 That is because we have a Festival Survival Kit to give away, all thanks to our mates at Bitmore, filled with useful bits to make your festival the bestival. 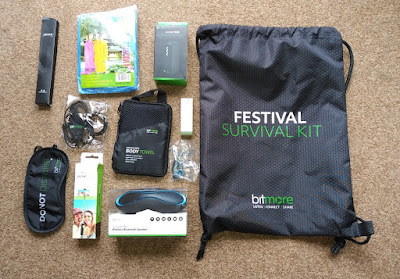 The Bitmore Festival Survival Kit has the modern festival goer in mind. It therefore concentrates on the essentials: power for your phone, helping you to take selfies, keeping you dry, helping you sleep, and making sure your breath is fresh so you can snog whoever you like. 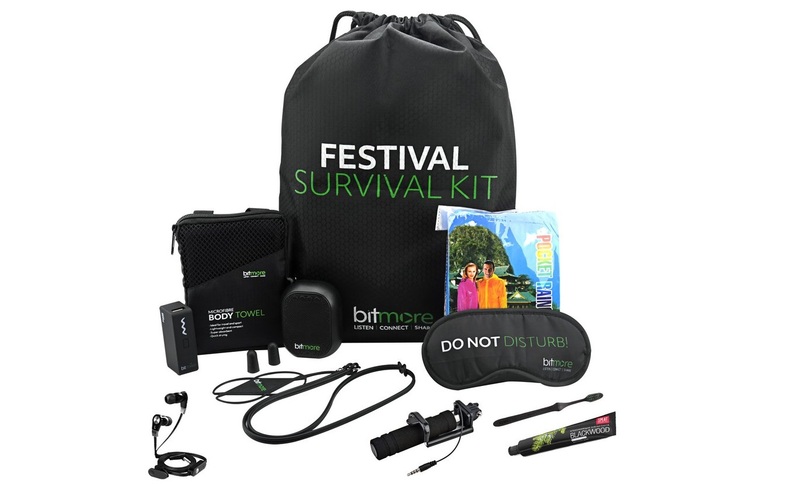 The kit, which retails for £29.99, contains (deep breath)... a waterproof over shoulder drawstring bag, a Bluetooth Speaker with a mic for hands-free calls, a wired universal Selfie Stick, a 3000mAh re-chargeable power pack for your USB gadgets, a waterproof disposable poncho, in-ear headphones with mic, a quick drying micro fibre towel, an emergency tooth brush & toothpaste set, an eye mask, foam ear plugs, and a neck phone hugger to keep your phone safe on a lanyard. Phew. This is a pretty excellent kit, especially considering the techy items like the Bluetooth speaker, selfie stick, and portable power pack. Everything else is a really lovely inclusion, and there's no doubt that each and every one of the items will be useful for a festival in Britain. Coz it tends to rain, don't it? To enter simply follow us on Twitter (@thetestpit), retweeting any tweet we've posted about the competition, or Like us on Facebook (/thetestpit) then share the competition post. Do either of these things before 6pm on 7th July 2017. The competition will close at 6pm on 7th July 2017 and the winners will be notified soon after. UK entrants only please. To win the entrants must be either following The Test Pit on Twitter, or have previously 'Liked' The Test Pit's Facebook page. The judges' decision is final. For T&Cs please send us an email.